On Sunday, May 17th - which is when we celebrate Earth Day at Jeff Street - this year we had an added bonus and matter of praise: We have had Solar Panels installed! 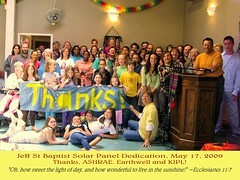 The Project was made possible with a donation from ASHRAE (the American Society of Heating Refrigeration and Air-conditioning Engineers) to purchase the panels and installation donated by Earthwell Energy Management, Inc.
ASHRAE is paying for the materials as a part of their 2009 sustainable footprint project. They hope to help offset their environmental impact caused by having their conference in Louisville in June. Ken Peet, chair of the Sustainability Subcommittee and President of local LSE Engineering, Inc. says with the help of KIPL (Kentucky Interfaith Power & Light), "we selected the church due to its existing efforts to save energy." We can't thank our friends at KIPL, ASHRAE and Earthwell enough for this fantastic gift. It is a gift that will only keep on giving. Thank you. In a great big burst of creativity and power and shared language, in the midst of a teaming mass of praying, laughing, waiting, wondering people, in languages that no one of them could ever have spoken, in awe, individually and collectively, to each believer in a very personal way and to all of them together, this is how the church began…Happy Birthday, followers of Jesus, Happy Birthday, Body of Christ! This is what was spoken through the prophet Joel: ‘In the last days it will be, God declares, that I will pour out my Spirit upon all flesh, and your sons and your daughters shall prophesy, and your young people shall see visions, and your old people shall dream dreams. Even upon my slaves, both men and women, in those days I will pour out my Spirit; and they shall prophesy. There are images abundant in this morning’s scripture passage. But this morning I am thinking of those tongues of fire, and how they rested over the head each of the believers. I think it’s fascinating and fitting that Luke describes them as “tongues” of fire. Not just flames, but tongues, God’s expression of self, God’s words comes into and through the believers, then and now. They become God’s voice, we become God’s tongue, God’s voice, God’s expression of self. As followers of Jesus, of course, we believe that Christ was God’s expression of self. In the beginning was the Word, and the Word became flesh. God expressed Godself through Christ. That’s why we’re here this morning, that’s why we call ourselves Christ-followers. Christ is the clearest picture that we’ve been able to find of God so far, God’s most precious expression of self. Sure, we get that. But whoever would have thought that God would be so pleased with that expression-attempt that God would just keep on at it. They were patriots, rebels, prostitutes, destitute, thoughtful, impetuous, lovable, disagreeable, faithful, and doubtful, is Ken Sehested’s description, disciples who had not believed themselves capable of tying their own sandals without Jesus, is Barbara Brown Taylor’s. And God chose them as expression, as voice, as hands and feet and heart. As lovers and resisters and builders of God’s New Order. Bill Wylie Kellerman says, The story in Acts 2 begins presumably in the upper room and ends in the streets of Jerusalem…The disciples take resurrection to the streets. They go public. One day they can’t even tie their own sandals, and the next they are going public, taking resurrection to the streets. To the authorities it must appear as political madness, an acute and hopefully isolated case of sanctified anarchism. Some people say that they have had too much to drink. Granted this refers in part to the inspired and ecstatic utterances, but I wager even more so to their reckless courage. After what’s been done to Jesus, you’d have to be either crazy or drunk to be shouting his name in the streets and pointing accusing fingers at the executioners. Heretofore the disciples have beheld Christ; now they experience the concrete and practical freedom of the resurrection. No political authority any place or any time can shut that down. They become God’s word, God’s expression, God’s fearless voice of confrontation, of gospel-good news, of second chances galore, of the alternative Way of living in this world, not alone, not insular, not for self, but for God, for one another, for all. Sermon excerpts from Pastor Cindy's magnificent Pentecost Sunday sermon. 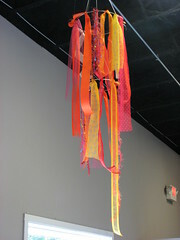 And dig the really cool "tongues of fire" mobiles she did as artwork!! What a multi-talented pastor we're blessed with!